Congrats to Marcia & all of this year’s “Freshy” Award Nominees! 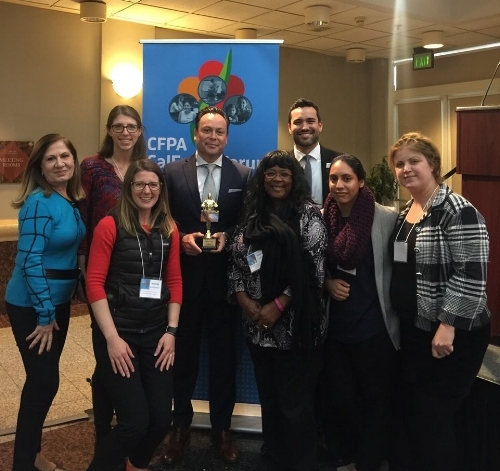 At this year’s California Food Policy Advocate’s CalFresh Forum, our very own CalFresh Outreach Coordinator Marcia Garcia was part of prestigious group recognized for their outreach to expand and improve the CalFresh program in their communities. She was among the leaders nominated for the conference’s “Freshy” awards in the category of Innovative Outreach Leader of the Year. Partners are encouraged to nominate and vote for each other. The awards also recognize outstanding program administrators, grassroots mobilizers, and improvements in CalFresh utilization rates by individual counties. Marcia has worked with the San Diego Hunger Coalition to increase access to CalFresh for the past two years. During that time, she has demonstrated herself to be a leader in providing technical assistance and guidance to both clients and partners in navigating the complex CalFresh regulations and eligibility guidelines. She has served as a facilitator for Benchmark Institute’s FAST training and has developed countless outreach materials to spread the word about important program changes affecting San Diego County. Marcia regularly goes the extra mile to make applying for CalFresh easier. Her commitment to the CalFresh community and those served by the San Diego Hunger Coalition’s work can be heard every day as she brings levity to challenging conversations. Marcia was among 10 experts nominated for the Innovative Outreach Leader of the Year. Also amongst those nominated was San Diego’s Juliana Vega, CalFresh Outreach Coordinator at our partner the San Diego Food Bank. The Freshy was awarded to Elizabeth Gomez, Associate Director of Client Services for the Alameda County Community Food Bank. While there could only be one winner this year, we are so proud Marcia was recognized for her great work to end hunger in San Diego County. The communities of all of the nominees benefit directly from their contributions.